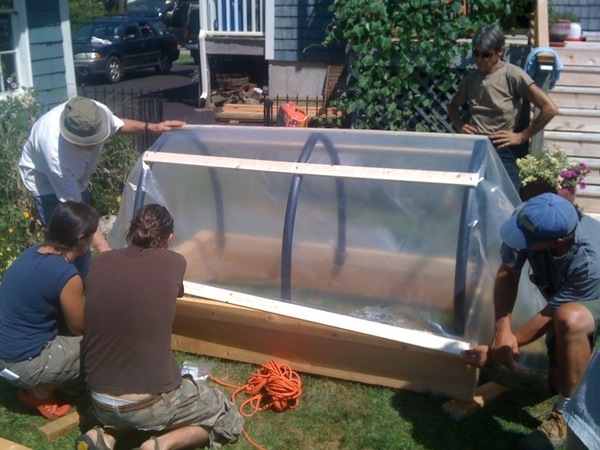 The Resilience Hub emerged out of the Portland Maine Permaculture Meetup Group, which was founded in 2005 by Lisa Fernandes after she returned from the “Fueling the Future” conference in Kinsale, Ireland. Since then, the Resilience Hub has evolved as an organization to hold community permaculture activity as well as more advanced projects. Our work is grounded in the permaculture ethics of Earth Care, People Care, Fair Share (and Future Care!). As with permaculture itself, our work touches many topical areas. Graduated more than 300 students from Permaculture Design Certificate Courses since 2008. Graduated more than 50 students from the Advanced Permaculture Design Course; 20 of those students are using their permaculture design skills directly as part of their livelihoods. Hosted Rob Hopkins for one of his few North American appearances in October of 2013. Have provided professional permaculture consultation & design services to several hundred clients. Convened the first Art of Hosting Training in New England in April 2014 and a follow-up Art of Collaborative Leadership training in November 2017. Organized the successful 2010 and 2014 Northeast Regional Permaculture Convergences in Maine for more than 400 people each time. Have averaged more than 70 events per year since 2005, ranging from skill-sharing events and workshops through guest lectures, courses and work parties. Have created a “convening point” for more than 2,800 program participants via our Portland Maine Permaculture web site and calendar of events. Convening point for the statewide permaculture organizing and catalyzing the Portland Permablitz Network (completed its fifth season in 2017). Helped incubate the first Maine Tool Library which opened in 2015 as well as the Coop Design Lab, the Portland Permablitz program, the Repair Cafe idea, annual permaculture plant swaps, and permaculture group-ordering programs for tools and resilience-building supplies. Have created a broad collaborative network with local businesses, organizations and agencies to build region-wide resilience. Active in local, state and regional food-system and food security planning initiatives. Active in Northeast Regional Permaculture Network and the New England Resilience and Transition (NERT) Network and connected to continental and international permaculture networks.